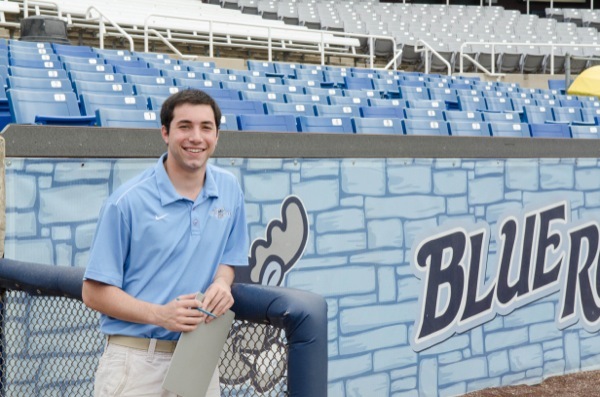 As a freshman in high school, University of Delaware student Max Gutman stumbled across a game called Strat-O-Matic baseball, a realistic simulation of statistically accurate baseball that has been around since 1961. He soon found himself simulating an entire 162-game season with all 30 teams and quickly realized how much he enjoyed statistics. By the time an Advanced Placement course rolled around during his senior year in high school, Gutman knew that statistics would be something that he’d be studying in college. Now, as a senior majoring in statistics in the College of Agriculture and Natural Resources Department of Applied Economics and Statistics (APEC), Gutman is not only studying statistics, he is applying it in the real world by working as a statistical inputter for the Wilmington Blue Rocks minor league baseball team, as well as for the UD football, volleyball and basketball teams. Gutman has also done statistical work for the Maryland State Police, with which he interned last summer doing training data analysis. Gutman explained that as a statistical caller, he relays the data — such as a 10-yard run in football or a jump shot or rebound in basketball — to an inputter, who logs the information into a computer. “If you’re on the Internet and you’re watching a live gamecast, when a play updates on there, that’s being done by the guy who’s inputting,” said Gutman, who explained that for football, there is usually an offensive caller and a defensive caller. Blue Rocks Because the Blue Rocks are a Class A baseball team affiliated with Major League Baseball’s Kansas City Royals, Gutman said that he had to go through a rigorous training program that included learning the code sheet, with different numbers and symbols for every possible play that can happen in baseball. Using those codes and symbols, Gutman had to go through an outline of 14 baseball games in a text file with every play that happened throughout the game and code that game exactly how it happened. If he failed to achieve a certain score on the test, he wouldn’t be able to move on to the next level. Gutman said that for a typical game, he sets up his computer an hour early, records what the weather is like and the umpire for the game, and sits in the press box with an official scorer in case there is any confusion. Statistical student As for his studies at UD, Gutman said he enjoys the statistics program because of the closeness of the group. “We’re a pretty closeknit group and being here [in Townsend Hall] secludes us a little bit from up campus, so it gives us a nice little spot to meet up and do our work privately, which is pretty nice. And it’s like a home for me because I’ve had a lot of classes down here,” said Gutman. He added that he has enjoyed all the time he’s spent with his adviser, Tom Ilvento, professor in APEC. “Dr. Ilvento has been a huge guidance for me for all four years. He said that he’s never actually had someone come in and throw statistics in with sports but ever since that sports science stuff started coming out on ESPN, I’ve been really interested in that and number crunching,” said Gutman. “I’m a huge football fan so he’ll send me articles out of nowhere that he finds — interesting stuff on whether or not to go for it on fourth down, to punt in certain situations. I’m a numbers guy, clearly, so I do everything by the numbers — if I were a coach, I’d probably be doing things a lot differently.” When it comes to why he loves sports statistics, Gutman explained that he likes how they can be manipulated. “You can make anybody look good in some fashion. Then on the other hand, that’s also extremely misleading, but I think the coolest part about it is just being able to very easily compare one person to another in a particular category.” Gutman said that his favorite stat in baseball is batting average. “That is such a simple thing to say — this guy is clearly better than him because he has a better batting average.” He also said that an advanced stat that the public might not know about — but which is very useful to the game — is wins above replacement, or WAR. “Essentially it combines almost every baseball stat you can think of into one and it spits out a number. Basically it’s how many more wins this player is going to give you versus a replacement player throughout the whole season,” said Gutman. “So I think this past year in the MLB, Carlos Gomez of the Milwaukee Brewers had a WAR of 8.9, so if he played all 162 games over a different center fielder, he got them eight more wins by himself throughout the season than a replacement player.” Article by Adam Thomas Photos by Danielle Quigley This article can also be viewed on UDaily.